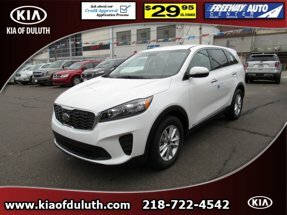 Description Armed with a backup camera, blind spot sensors, Bluetooth, braking assist, hill start assist, stability control, traction control, anti-lock brakes, dual airbags, and side air bag system, you won't be able to get enough of this 2019 Kia Sorento LX AWD. We're offering a great deal on this one at $32,435. With a 5-star crash test rating, this is one of the safest vehicles you can buy. The exterior is a ravishing sangria. Interested? Don't let it slip away! Call today for a test drive.